Alaska! I can’t tell you how amazing this 49th state is. I arrived here in Anchorage to represent the Postural Restoration Institute to teach the class we call Cervical Revolution. I was hosted by Joy Backstrum PT, PRC and Katie Piraino PT (soon-to-be PRC) who own The Physical Therapy Place LLC. Our group included several PT’s who are already planning on achieving their PRC status. 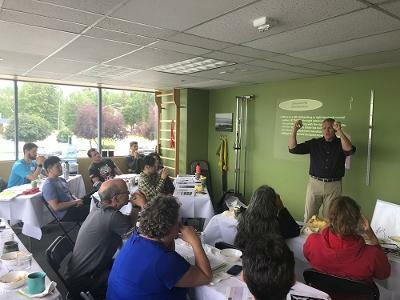 Also on hand was Owen Mandanas DDS who owns a dental practice in Anchorage and has a strong interest in PRI and her role as a PRI practitioner working with PT’s in Anchorage. Laura Kompkoff OD is an optometrist who works with Joy and Katie and has attended several PRI Vision courses. She has a strong interest in PRI and continues to improve her skills as she treats patients. Together, we all dove into the complex details of management of the cervical spine first by understanding the polyarticular muscle chain called the Temporo-Mandibular Cervical Chain (TMCC) and then the rather significant details of the cervical spine’s arthrokinematics as they relate to the occiput and bones and joints of the cranium. We then explored cranial strain patterns and the role the entire stomatognathic system plays on the cervical spine. While this class can sometimes seem daunting at first, I would like practitioners to know that it isn’t as bad as it may seem and that the information is vital to answering questions you may have about progressing your own patients. I plan on remaining here in Alaska for a couple more weeks and enjoy the scenic beauty as I venture into the interior with my daughter Sophia. So, while you’re reading this, I will be on a horse in a pack string of horses looking for a Dall Sheep Ram and some caribou. I hope to see you soon in a class somewhere but if you EVER get the chance to come to Alaska for a course....DO IT!! !